More than 71 percent of the earth’s surface is composed of water, yet less than three percent of the water is suitable for human consumption. Of that three percent, more than 70 percent of that water is used for agricultural purposes. With those numbers in mind, personnel from Fort Valley State University’s Cooperative Extension Program, offered the first Water Safety and Conservation Workshop at the Agricultural Technology Conference Center (ATCC) on Jan. 15. “Water conservation has become relevant because the world’s population is increasing. By 2050, the world’s population will have tripled, increasing the need for water,” said O. Lydia Ojarikre, FVSU Extension’s water resource specialist, who organized the workshop. “I thought it was very important to bring people together and talk about water conservation because the practice cannot be just from the government. Everybody must be on board,” Ojarikre said. 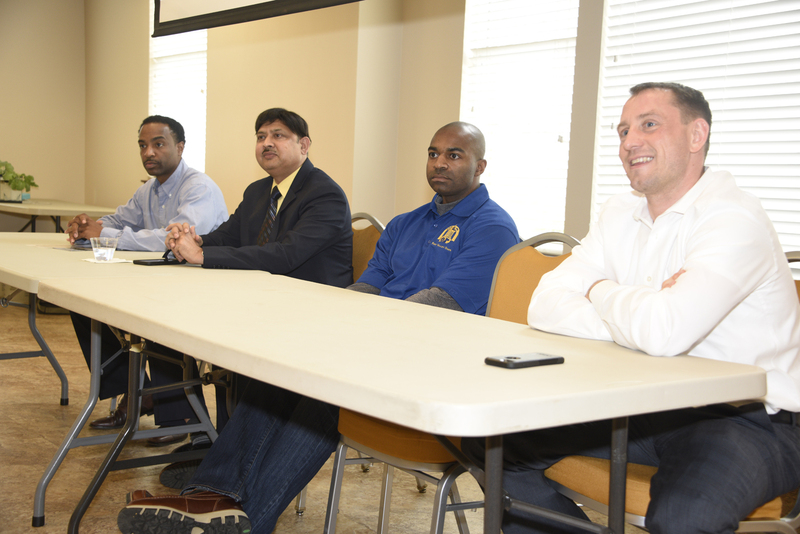 (From left to right) Dr. Cedric Ogden, FVSU assistant professor of agricultural engineering; Dr. Hari Singh, FVSU research professor and coordinator for the biotechnology program; Donald Bacoat, FVSU aquaculture and production assistant and Ned Van Allan, director of business for the filtration company Jutuma Waters, answer questions about water contamination and conservation during the Water Safety and Conservation Workshop at the Agricultural Technology and Conference Center on Jan. 15. Ojarikre said the conference provided attendees the necessary information needed to practice proper water conservation. The FVSU water resource specialist said she wanted to make sure that the agents and specialists take the information discussed and forward it to their clients and county representatives. “My hope is that they will give that information to people who will play significant roles in seeing that water is conserved for the future,” Ojarikre said. Additionally, Ojarikre said that people should practice conserving water because it is a finite resource. Erica Chaney, a resident of Fort Valley, said she attended the workshop because she has a well at her residence and is concerned about water contamination. She said it has been quite a while since she had the water tested and added she was not aware of the level of filters and contaminants in her well. Chaney plans to have the water tested as soon as possible. For more information about future water conservation and safety workshops, contact Ojarikre at (478) 825-4322 or ovigueroye.ojarikre@fvsu.edu. Featured image: Donald Bacoat (right), Fort Valley State University’s aquaculture and production assistant, explains the basics of aquaculture to Shakeena Reeves (left), a junior agricultural economics major, during the Water Safety and Conservation Workshop at the Agricultural Technology Conference Center on Jan. 15.